One of the things I am really passionate about as a Nutritionist is teaching people the importance of eating real food. By doing this you are avoiding food like products that tend to be devoid of nutrients and also contain lots of nasty food additives. 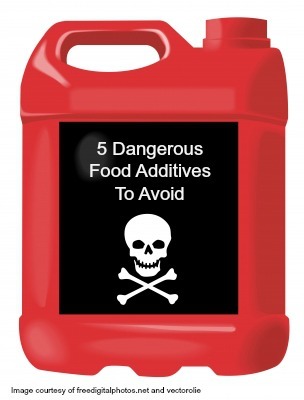 Here are 5 dangerous additives to watch out for, there are many more but if I wrote about them all you would be reading for days! Used in high-fat foods such as oils, butter, meats, cereals, chewing gum, beer, snacks and baked goods to prevent them from going rancid and smelly! They are associated with hormone disruption and development of tumours after long-term use. BHT specifically has been linked with genetic mutations. BHT/BHA may be carcinogenic to humans. Used as a preservative in meats. May lower oxygen-carrying capacity of the blood and may form carcinogens in the body and can be destructive to the adrenal gland. Used as a preservative in carbonated drinks, pickles, sauces and some medicines. May aggravate asthma and is suspected to be a neurotoxin and carcinogen, associated with fetal abnormalities and worsens hyperactivity. Used to alter the colour in smoked meats and fish, without this they would look grey! Can form highly carcinogenic (cancer causing) substances in the body with stomach acid. Food colours are just plain terrible but I picked 2 to give you an idea of the damage they can cause in the body. Sunset Yellow (E110) found in sweets, snack foods, ice-creams, yogurts, drinks. It is associated with growth retardation and severe weight loss in animal studies. Can contribute to life threatening respiratory issues in those that suffer from asthma or allergies and is associated with DNA damage and tumours in animals and increase cancer risk in humans. Tartrazine (E102) FD & C Yellow No. 5 is found in ice cream, carbonated drinks, canned pastas, fish sticks. This is associated with hyperactivity, asthma, skin rashes and migraine headaches. Could your headaches, skin issues, asthma or hormonal issues be related to the consumption of any of the above? If you think there could be a connection, hit reply or email me at melaniegrimerhn@gmail.com to come in for a free 30 minute chat and see how I can help you. Last week i went to a cooking class with Jentree Whole Foods and i got to taste her beet hummus. I am a big hummus lover and this new spin on it was out of this world. Click here to check out the recipe. Place cut beets on a large piece of foil and drizzle with 1 Tbsp oil. Wrap and roast for 30 minutes – 1 hour or until beets are knife tender.